Former Lakeville Motor Express employees and supporters rally outside Maple Grove-based Finish Line Express, which workers say absorbed LME’s business. MAPLE GROVE – Heartbreaking, gutless and dishonest were among the ways workers, union leaders and high-ranking elected officials described a Roseville trucking firm’s decision to withhold pay from 90 members of Teamsters Local 120 after abruptly closing the week of Thanksgiving. 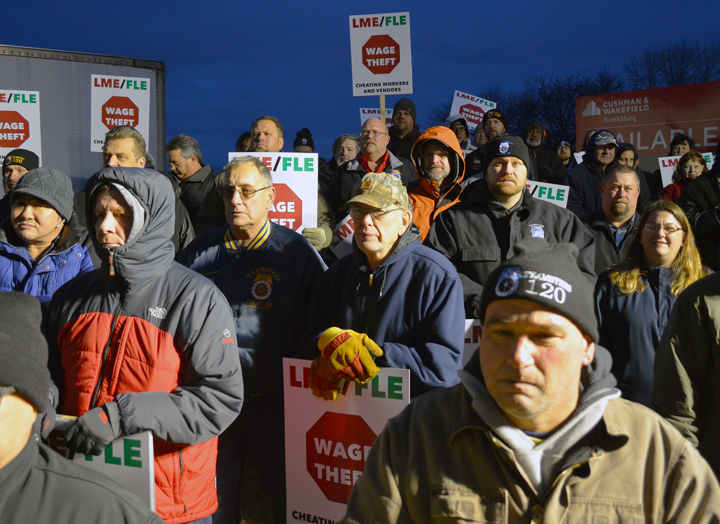 Out-of-work Teamsters staged a rally last night outside Finish Line Express, a Maple Grove-based trucking company that, workers allege, has absorbed Lakeville Motor Express’ business since it abruptly closed shop Nov. 20. Local 120 President Tom Erickson said the closure was “surgically done” to shake off the union’s contract more than a year before it is set to expire. “The same management team that was over in Roseville is exactly the same management team that is in that place,” Erickson said, pointing to Finish Line Express. Local 120’s officers pledged a campaign to raise awareness of Finish Line’s “shady business practices,” particularly among the company’s clients. They include John Deere, 3M, Land ‘o Lakes and Toro – which, not coincidentally, are many of the same clients Lakeville Motor Express served. Meanwhile, state officials are pursuing wages owed to workers locked out of their jobs by LME. Lieutenant Gov. Tina Smith, who likened the company’s behavior to “stealing,” said the Department of Labor and Industry has filed six claims on behalf of former LME employees already. “And I suspect there will be more,” Smith said. Teamsters Local 120 “passed the hat” to support out-of-work LME drivers. Steve Satterlee said he doesn’t know how he’ll afford medication for his wife, Wanda, who is disabled. Lisa and Shane Thompson, pictured with their two sons, are both looking for work since Shane found himself out of a job three days before Thanksgiving. Several former LME workers described having their lives turned upside down by the company’s sudden decision to pick up and, allegedly, move to Maple Grove without them. For both Roger Nelson of White Bear Lake and Steve Satterlee of Cottage Grove, there could not have been a worse time to lose their family health insurance coverage. Nelson’s wife faces surgery, and Satterlee’s relies on expensive medication to live a “normal life” with a disability. Smith pledged assistance for workers navigating the state’s unemployment insurance system, and she said LME could face penalties if it refuses to comply with orders to pay back wages. “I want the people in these buildings to understand that they cannot just get away with this,” she said. I encourage EACH and every former LME employee that recently lost his/her job to INDIVIDUALLY file a wage claim on the official form provided by the Department of Labor. Blessings to all. This is Maggie Trowe at the Militant newspaper. We are running an article on Lakeville Motor Express union-busting and wanted to use the photo of the Dec. 1 rally that ran with your Dec. 5 article. The one that’s posted is usable, but low-resolution. Could we get the original? John See suggested I contact you.